More than 40 papermakers from numerous mills and representing six countries attended a lunch and learn event hosted by the technology company Voith during the MIAC exhibition in Lucca, Italy. 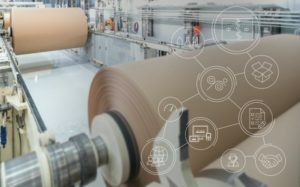 Attendees had the opportunity to learn about the digital future of the paper industry and innovative technologies. During the session, Voith representatives gave short presentations introducing the company’s latest products. During the event, Voith experts introduced four digital products. Voith’s IIoT platform OnCumulus serves as the data hub for data from all kinds of sources – for example plants, production lines, machines and devices. Customers benefit from one central hub for their data from which they can launch their digitalisation initiatives. The OnCumulus.Platform is based on open-source and highly standardised technologies. It provides fast, reliable and secure access to data from local machines and systems in the cloud, as well as fast provisioning for value creation. The platform is scalable, flexible and extensible at any time. OnCare.Asset is one of the applications that runs on OnCumulus. It increases the accessibility, usability and transparency of plants. The system helps to manage all maintenance activities and enables easy spare parts management. Furthermore, it grants simple access to support and increases the interconnectivity of the whole equipment. Product quality can fluctuate at various stages during production due to a lack of control and visibility of some sub-processes. OnEfficiency is an intelligent digital solution that resolves this issue. Using insight data and sustainable data analysis, it provides an accessible way of stabilising and optimising production. The product quality becomes more reliable, the production costs decrease, and KPIs can be targeted accurately. OnCare.AR supports customers by identifying equipment through searching for plant identification codes or scanning the nameplate itself. Customers can access their information easily from different silos and host it at the right place at the right time via augmented reality technology. This enables fast and efficient remote service, for example. The system collects and delivers all necessary information from multiple sources – with a proven UI/UX on tablets, smartphones and new devices like the Microsoft HoloLens. “The event has been a great success for us. We have received a lot of positive feedback from our customers. That motivates us to organise a similar event next year,” summarises Francesco Manzo.